Nineteen years later, the So-Kei games were revived on October 19, 1925. The game took place at the Waseda University Totsuka Baseball Grounds. Then-captain Abe stood on second base on the Totsuka grounds, and declared the return of the So-Kei games. He addressed the spectators, saying that supporters on both sides were to display exemplary behavior, which was greeted with applause. The game that followed was also excellent. The game ended with an 11 to 0 victory for Waseda. The team continued to win the league that followed, and went on to champion the 1925 Autumn League. The Waseda University Athletic Center and Keio University Athletics Association websites are mutually linked via the “So-Kei games banner” below. On the Athletic Association’s website, the page dedicated to So-Kei games is adorned with the original letter of challenge to Keio University for the Waseda-Keio match*, written by Waseda’s second captain, Shin Hashido. 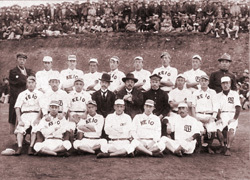 The Keio and Waseda University baseball clubs (Baseball club general manager Isoo Abe, captain Shin Hashido, and club members from both Waseda and Keio Universities) 1904. Photo taken at Totsuka Baseball Grounds. Spectators can be seen in the background. 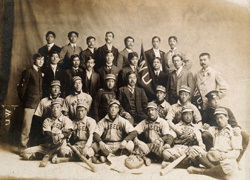 Memorial photograph to celebrate the first US trip (General Manager Abe and Waseda baseball club members. The party took three WU flags with them.) 1905. Have you heard of “the Last So-Kei Game”? It refers to the baseball game between Waseda and Keio that took place on October 16, 1943 at Waseda University’s Totsuka Baseball Grounds. Click here to find out more. Have you heard of “the Last Waseda-Keio Game”? It refers to the baseball game between Waseda and Keio that took place on October 16, 1943 at Waseda University’s Totsuka Baseball Grounds. Click here to find out more.